Dictation is available to the Mac with newer versions of system software, but despite being one of the major features of Mac OS you may find that it’s not enabled by default on some Macs. It’s easy to enable Dictation on a Mac though and it’s even easier to use, let’s get started to learn how to enable this handy voice-to-text feature and then how to use it in Mac OS. Dictation is available on any modern Mac OS release, including MacOS Mojave, High Sierra, Sierra, El Capitan, Yosemite, Mavericks, and Mac OS X Mountain Lion. The confirmation dialog tells you that anything you say is sent to Apple in order to be converted to text, that’s because the speech-to-text conversion is done remotely through Apple’s cloud servers and then transmitted back to your Mac. In order to be accurate with peoples names and addresses, the Contacts list is also transferred to Apple. If you’re at all worried about security you can avoid the Dictation feature, or click on the little privacy button in the pref panel and read about Apple’s policies. Personally I think unless you’re in the NSA or some other highly secretive organization, there’s nothing to worry about with Dictation, because Apple is interested in selling you software and hardware not listening in on your conversations. The default Dictation button is the “fn” (function) key, that can be changed within the Dictation options but it’s a good default choice so there isn’t much reason to switch it. Dictation works very well, though some unusual words and phrases it seems to have a hard time with but annunciation can help in much the same way that typing things how they sound rather than are spelled can help with text-to-speech. Background noise can easily mess up the conversions too, so it’s best to use in an otherwise quiet environment. Overall Dictation is a great feature, and if you haven’t enabled it yet or had a chance to type with it on the iPad or iPhone, do yourself a favor and try it out on the Mac if it’s running with a modern system software version too. For some reference and version support, Dictation first appeared on the Mac with Mac OS X Mountain Lion, and is also available in Mac OS Mavericks, Yosemite, El Capitan, Sierra, macOS High Sierra, and MacOS Mojave, and presumably onward. 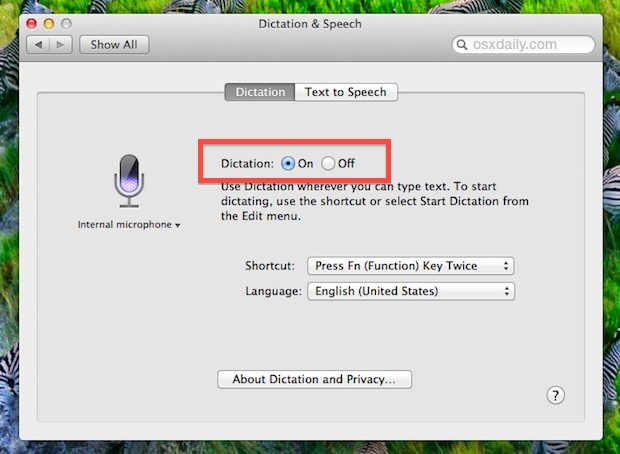 If you have any additional tips or helpful information about Dictation on Mac, share with us in the comments below. You probably have your microphone muted, I did and it wasn’t an option for me too. Get your mic working and Dictation works great! Yep, this app is the best free spyware in the world, clic on the “About Dictation and Privacy” & take 2mn to read it ! you finaly be aware all what you are going to say be sending to Apple servers..& More, like the paper inside say”, even when you talk about your father, sister etc…” the app going immediatly to make any corresping value in your Adress Book & send all the packet to apple !! Apple = FaceBook 2 ??? Sounds a little loonymoony to me! Dictation is great give it a try. what will happen after downloading the voice….i am from india…i tried dictation but its not working with my accent…now i am downloading the voice india-sangeeta…m not preety sure wht’s gonna happen after downloading the voice..pls tell me. I chose American English in preferences, and now can’t get the mic to come back to give it a go. Really impressed with Dictation. It seems to work just about perfectly. I even dictated this! Nothing, I don’t know why. I turned it on. Press Fn twice, mic shows and listens (from the level moving up and down) to me. But nothing comes out. The little purple dots running and shaking, and then nothing again and again. I don’t know what’s wrong with it. Upgrading and clean installing the OS X 10.8. Both method gives me no improvement. If the purple dots shake than it couldn’t understand you. It takes about 3 seconds for it to understand. Keep trying or just listen to what you are saying, like ‘hello’ select it and Edit >Speech >Start Speaking. Try to say it the same way! I dictated it. @Eak Thailand: I had that problem until I noticed that my Internet connection was not active. You might want to check your connection and try again. I cannot enable Dictation. Try severel times but nothing happens. but Dictation no. I use Tutorial but again nothing….. I can’t seem to get it to work in a google doc – is there a way? Thanks! How do you use it with a new Mac Mini? as there’s no mic in it. Was this written with Dictation?